At the start of 2016, our main priority was the creation and publication of our Libraries Deliver: Ambition document. Alongside this, we had a number of other ongoing projects and priorities. So did we achieve what we wanted to achieve? Well most importantly, we did publish our Libraries Deliver: Ambition document - there’s more on that below. We also saw completion of the DCMS-funded, Arts Council managed, wifi programme, resulting in over 99% of libraries across England now offering wifi access. We completed a round of meetings with officials and ministers in central government departments, resulting in a number of projects including with the Ministry of Justice on a pilot to provide dedicated work spaces in libraries (commuter hubs) for use by civil servants. And we published a toolkit containing good practice around community managed libraries with thanks to input from library partners and a wide variety of community and volunteer-run libraries. Having delivered on the immediate objectives we had set out during our initial 6 months of existence, our focus then turned to creation of an overarching strategy. As mentioned, the main item on the Taskforce’s agenda during 2016 was producing Libraries Deliver: Ambition. We set out a programme at the beginning of the year which aimed to fit in drafting, consultation and publication of the document by July. We held workshops with Taskforce members - drawing on their broad experience of strategies and plans that had been produced in the past - and went out to consultation in March with a draft document which broadly fell into 2 parts: setting out the range of activities libraries deliver and the benefits that flow from them, and how we proposed changes which would help the sector not just survive, but thrive. We shared the draft online via GOV.UK and promoted it via blogs and social media. We also held a series of open workshops around the country to give people the opportunity to dig deeper into the issues raised and share their questions, concerns and priorities. As this blog post explains, by the end of the process, the team had travelled over 2,200 miles, spoken with over 300 people and received over 200 (individual and organisational) responses to our online questionnaire. Having collated and analysed the responses, we set to work to reflect the input we had received into a revised document. We were on schedule to publish in July, then came the EU referendum. This resulted in a lot of change in central government, including ministerial changes in DCMS. Kathy described the implications in this blog post, and we then had to find out our new minister’s thoughts and ideas about how he wanted DCMS to contribute to the Taskforce's work. 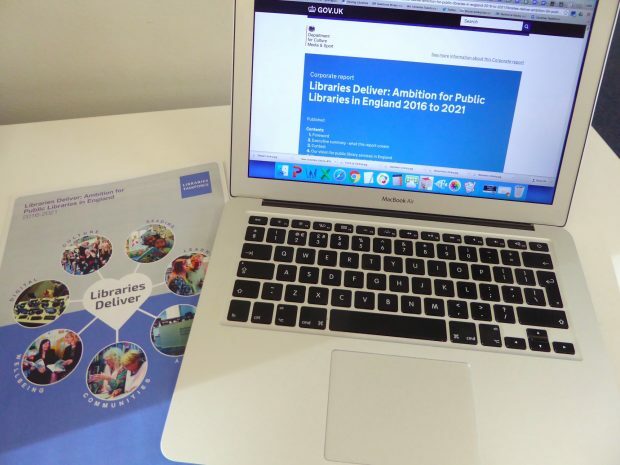 Based on these new inputs, we again revised the document and, having finally received all the clearances needed, we were all delighted that Libraries Deliver: Ambition for Public Libraries in England 2016 to 2021 was published on 1 December. The accompanying action plan will frame our work over the coming years. Alongside Libraries Deliver: Ambition, I was really pleased that DCMS and the Taskforce were able to launch a new £4 million fund to support projects that develop innovative library service activity to benefit disadvantaged people and places in England. Managed by the Arts Council, decisions about projects to be funded will be made by March 2017, and I look forward to being able to visit some of the successful applicants once up and running. 2016 saw several high profile anniversaries, and libraries were heavily involved in 2 of them: Shakespeare 400 saw a year long programme of events, including Selfie Saturday and lots of performances in libraries. The SCL has just carried out a review of the programme and produced a film: Celebrating Shakespeare in Libraries 2016. The third campaign was the BBC’s #Lovetoread programme which aims to promote reading for pleasure, particularly in public library settings. 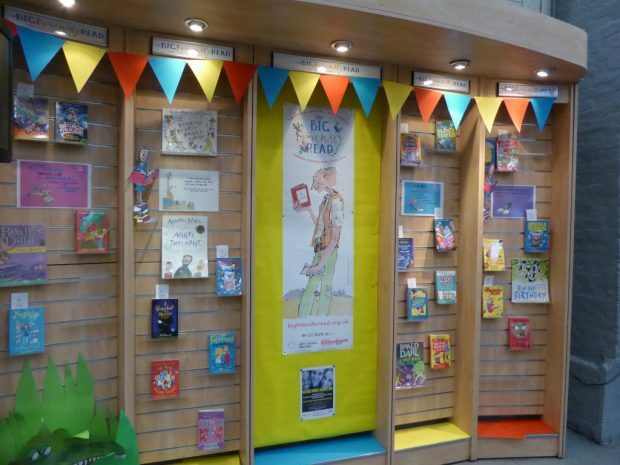 The BBC commissioned a series of activities through the year, which culminated in the #Lovetoread weekend in November, where books and reading were featured in almost every single BBC channel. Lots of new relationships were formed, in particular between libraries and their local radio stations. This campaign particularly shows the benefits of having heavy-hitting partners like the BBC included on the Taskforce. Throughout the year, business as usual continued. We held 6 Taskforce meetings, alternating between libraries around the country (including the Carnegie Room in Northampton central library) and being hosted by Taskforce member organisations. We also established a communications sub-group, and I’m particularly grateful to the representatives from across the library sector who have volunteered to work on this important priority. I and members of the Taskforce team have met with various government departments at official and ministerial level and with a wide range of individuals and organisations from partner organisations, the library sector and beyond. These meetings have been a great opportunity to highlight the value of libraries and the work they are already undertaking to support delivery of various policy outcomes. We have also been able to explore future potential opportunities for collaboration and options for library investment. Throughout these meetings, it has been heartening to see the passion and commitment for continuing to make public libraries across England into the vibrant community hubs we all know they can be. We also spoke at numerous conferences, and visited libraries in over 30 authorities. The full lists of organisations, conferences and visits are contained in our 6 month progress reports, which are published on GOV.UK. As mentioned, the Libraries Deliver action plan sets out our future work plan, and all the actions have deadlines or milestones against which we will monitor progress. The Taskforce is not responsible for running libraries, but we are in the incredibly privileged position of seeing the wide range of solutions being put in place to ensure that libraries continue to remain relevant to the needs of their communities. We will continue to share these across the network. A bright idea in one corner of the country may well become next year’s business as usual for all. We will also continue to identify challenges which would benefit from central support and try to find ways to make this happen. a continuing flow of blog posts and case studies which will illustrate the rich diversity of activities going on in libraries across the country. As you can see, we’ve covered a lot of ground in 2016, and we know there is lots still to do. I look forward to working with the Taskforce and you to achieve it.